In the town of East Lyme, Connecticut you will find the lovely village of Niantic. Located on Long Island Sound this beach community is the perfect place to visit on the weekend or live in year-round to escape the hustle and bustle of urban life. To protect your New England home or business from being invaded and damaged by local pests, trust the pest control experts (who have over 80 years of experience) Big Blue Bug Solutions. Our fully licensed and insured company and our friendly and professional technicians can provide you with the comprehensive and environmentally responsible services needed to protect your residential or commercial property from pests. Get in touch with us today to learn more about our company and our trusted pest control services! There are many great benefits to choosing Big Blue Bug Solutions to take care of your Niantic home’s pest control needs. Some of these benefits are listed below. Our Home Owner’s Policy or HOP provides customers with the services needed to eliminate pests and protect their homes from future invasions. HOP provides three service visits per year providing ongoing preventative treatments and ongoing monitoring of susceptible areas. Hop is guaranteed. If pests become a problem between our visits, we will return at no charge to take care of the problem. Blue Glove Service. This service guarantees that our technicians will wear blue gloves and blue booties when entering your home, helping to ensure that your home will be just as clean after we leave as it was before we arrived. We offer targeted services to help prevent and control specific pests: bed bug solutions, carpenter ant solutions, mosquito and tick solutions, termite solutions, wildlife solutions, and pest control insulation. Our technicians are always friendly, always discreet, always professional, and always in uniform. 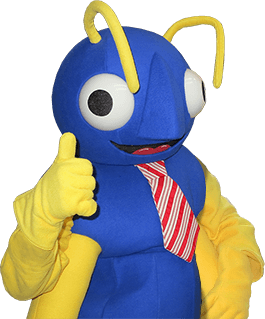 To learn more about why Big Blue Bug Solution is the best solution to your home’s pest problems, get in touch with us today. We would love to hear from you! Similar to termites, carpenter ants are a type of wood-destroying pest. However, unlike termites, carpenter ants don’t eat the wood they are invading. They invade wood to create nesting galleries to expand their colonies. If you are seeing large black ants wandering around near the outside of your home, on decks, porches, walkways, or in gardens or around garbage bins--or are finding them traveling through your kitchen--it is best to contact a professional pest control expert immediately. The pros here at Big Blue Bug Solutions will come to your property, perform a thorough inspection, and accurately identify the infestation. If it is confirmed that carpenter ants are living on your property or inside of your home our professionals can provide the services needed to eliminate them. Our carpenter ant treatments are very effective at eradicating infestations. In fact, we are so confident in the effectiveness of our carpenter ant solutions, we back them with a one-year carpenter ant warranty. This warranty can be renewed on a yearly basis and be transferred to new owners if you sell your home. To learn more about our carpenter ant solutions, call us today. In addition to our Monthly Maintenance Program, we also provide Integrated Pest Management services, pest control insulation, drain cleaning, and more exceptional services, to help you maintain a pest-free facility. To remove bed bugs from your Niantic home, you can’t simply wait them out and hope they will leave. And you certainly can’t snap your fingers and make them disappear. You also shouldn’t count on do-it-yourself treatment options you find on the internet. DIY bed bug control options such as using ultrasonic devices, placing moth balls around your home, freezing infested items, and throwing away all your mattresses and box springs won’t solve your bed bug infestation. In fact, the only things those DIY treatments WILL do is cost you time and money, and allow the infestation to increase inside your home. The only way to completely remove the bed bugs which have hitchhiked their way into your home, and to prevent a re-infestation, is to put a professional bed bug control service in place. At Big Blue Bug Solutions, we use modern, proven industry solutions needed to solve even the toughest bed bug infestation. When you contact us to remove bed bugs from your home, we will quickly come to your aid. Our highly trained, professional and patient professionals will perform a thorough inspection of your property. If it is determined that a bed bug infestation is present, they will without haste develop and implement a tailored plan to get rid of those bugs from your Niantic home. Contact us today to learn more our professional bed bug solutions.